The only problem is, the story I wanted to tell wouldn’t exactly work in straight-ahead novel format. Or more accurately, it could work as a novel, but it would (work) better as episodes. The first episode, THE B-TEAM, popped just after midnight. I read it in a single sitting. I’m not incredibly au fait with John’s OLD MAN’S WAR science fiction setting, having read only one book in that sequence (THE GHOST BRIGADES), but I wasn’t in the least bit lost by this latest addition to the series. I’d go so far as to say that you don’t need to have read anything in the sequence thus far to understand THE HUMAN DIVISION. It’s a thing hard to talk about without spoilers, this story. But let me try and frame it like this. Perhaps you remember one of Iain Banks’ impetuses for beginning to write military science fiction/ space opera. I can’t find the exact quote right this second, but it was something along the lines of wanting to rescue a genre he loved from a bunch of American fascists. The phrase “American fascists” is his, I’m pretty sure. Anyway. You get the idea. From Heinlein and Campbell through to Niven and Pournelle and the current-day state of that end of the field, it’s a pretty flat and reactionary field, full of flat and reactionary characters. 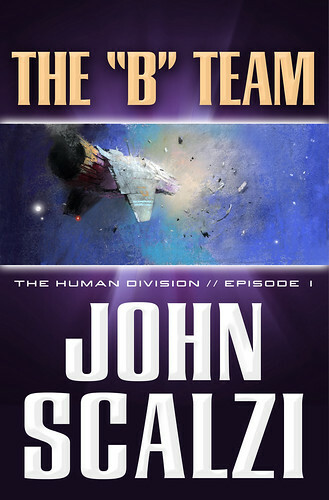 What Scalzi does in these books is take the second strain of military sf, the more liberal and literary works like Joe Haldeman’s THE FOREVER WAR, and sew it into the classic form. What comes out is rich and smart and funny – still very much a good-time rollercoaster entertainment, but also pleasingly human and self-aware as it rattles along its tracks, scattering spaceship wrecks, lethal diplomacy, species dieback and interstellar spookshow paranoia in its wake. This first episode was basically a really good laugh, and I’m looking forward to the following episodes appearing on my Kindle. As far as I know, all forms of ebook reader and retail can get you a copy: Kindle, Kobo, Nook, iBooks etc. 99 cents in the US, 64p in the UK.